Imagine rows and rows of open-air kitchens on a major city street. At the outer edges, you hear people talking over each other in Catalan, Spanish, Arabic and other languages. Some of them are hunched over tables chopping vegetables and meat. Others hover around dozens of industrial-size pots on grills at the center of the kitchens. The cooks periodically remove the lids, stirring and scooping their ladles full of steaming ingredients, inspecting their food to see if it’s ready. 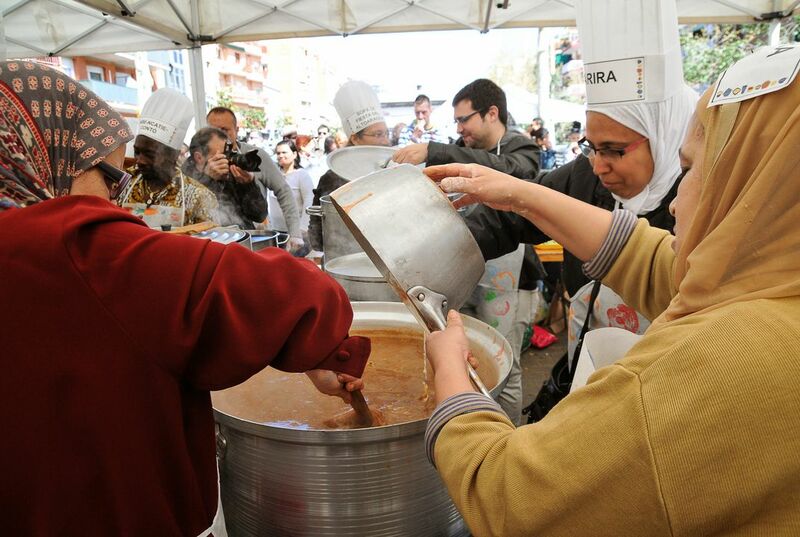 This scene plays out each spring at the Festival de Sopes del Món Mundial (World Soup Festival) in Barcelona, the capital of Spain’s Catalonia region. Sopes del Món embodies the Catalan vida a la plaça (life in the plaza), one of the themes of this year’s Folklife Festival program. The plaça major, or main town plaza, has long played a meaningful role in Catalonia and throughout Spain and Europe. Farmers and merchants go to the plaza to sell produce and other goods. Catalan municipalities provide social and financial support for cultural traditions including festes majors, or patron-saint celebrations, and the castellsgroups that practice and create human towers in the public square. Residents also flock to the plaza to drink and dine. “People have argued this up-close sharing of food is a fundamental aspect of Catalan culture,” explains Michael Atwood Mason, director of the Center for Folklife and Cultural Heritage and co-curator of the Festival. “Many small towns have a festival where everybody literally puts out tables in the streets, and they have a meal together,” he adds. Catalonia’s reputation as a país d’acollida, or welcoming country, contributes to this. Such openness stems from Catalonia’s location, on the Mediterranean Sea and along the Pyrenees mountains, and its history as a magnet for migrants and invading armies. Over the centuries, the Greeks, Romans, Carthagenians, Visigoths, Arabs and others have seized the region from one another. “Historically Catalonia was a buffer between different empires,” says Mason. “One to the north—modern France, if you will—and Spain to the south, which at times was Muslim,” such as when the Moors controlled the Al-Andalus territory, or Christian, starting from the first century. The Principality of Catalonia enjoyed autonomy until King Philip V abolished its constitution and national assembly. By 1714 he also had banned the Catalan language. During the mid- to late-1800s Renaixença (Rebirth or Renaissance), Catalans pushed to revive their language. Workers formed labor unions. Catalans birthed their culture of associationism by establishing non-governmental groups dedicated to preserving regional traditions. Throughout the 20th-century, Catalonia cycled through legislation that granted, then revoked, then renewed limited forms of autonomy. Gen. Francisco Franco overthrew Spain’s government during the Spanish Civil War with the help of Nazi Germany and Fascist Italy and by 1939 was cracking down on public expressions of Catalan identity (Basque identity, too). Spain’s economy sputtered alongside the post-World War II unrest until Franco approved policies proposed by Catalan economists that spurred the Spanish Miracle of the 1960s and 1970s. Catalonia especially benefitted, attracting international tourists and migrants from elsewhere in Spain looking for work in the machinery, textiles, automotive or petrochemical industries. Newcomers settled in Barcelona and gravitated toward the Nou Barris (noh BAH-rees) district. Nou Barris gets its name from the original “nine neighborhoods” that comprised the district. Spain eventually had the world’s second-fastest rate of economic growth. Then, like much of the West, Spain struggled through the recessions of the late 1970s and the 1990s, but enjoyed the late-1990s boom. The country joined the Eurozone in 1999. These developments, combined with wars and climate-related calamity around the world, drew immigrants from Central, North and East Africa, the Middle East and elsewhere in the global South. Many landed in the neighborhoods of Raval and Nou Barris, bringing other languages, food traditions and faiths. The newer immigrants couldn’t yet speak Catalan or Spanish, explains Pablo Giori, research associate at the Center for Folklife and Cultural Heritage and a Festival advisor. As a result, Giori says, conflict was prevailing over friendly curiosity. “The situation [that breeds] discrimination is, you don’t know your neighbor,” he says. The Barcelona government knew it needed to diffuse tensions and encourage collaboration between Catalans and immigrants. Cultural institutions, including life in the plaza, became crucial to embracing the newcomers and their contributions to the community. “Integration depends on the town halls and civil society,” Giori explains. “That’s where Catalonia was working hard to connect with this population.” Barcelona wanted to bring the recent arrivals into the plaza by focusing on something enticing that they could introduce to their Catalan neighbors: their native foods, specifically soups and stews. Catalonia’s foreign-born residents are among the approximately 258 million people currently living somewhere other than the country of their birth. Slightly more than half of those living in Nou Barris were born in Catalonia, with the rest of the population almost evenly split between migrants born elsewhere in Spain and those from overseas. Catalonia remains committed to its newcomers, as well. Nou Barris, one of the most ethnically diverse of Barcelona’s 10 districts, hosted the first annual Festival de Sopes del Món Mundial in 2004. The 15th Sopes del Món took place in March. The Smithsonian Folklife Festival is ongoing daily and most nights from June 27 to July 1, and July 4 to 8.